I got the video after I saw the Giro was riding it. Most of the time its 16% grinding for me and I can make almost no speed. I believe it to be harder than the Mortirolo, and I did not think that possible. I ran out of gas today with 2.6k to go, and it looks like it may soften some before I go over the top. Its the first video I've ridden that has cyclists weaving and resting on the side of the road. ...you don't have to worry about stalling out and falling over. I don think I've ever stalled on a climb and fallen over. Though on The Rockpile I've had to put my foot down because I was stopped in my tracks by the wind, and then nearly blown off a hairpin. Achambo Rd on D2R2 (27%, dirt wth some ruts) was a bit sketchy because the front wheel would lift up, which is fine, but then you had to get it down outside of a rut, which wasn't easy because you were grinding at about 40 rpm, and the front end would weave back and forth. My buddy Mike got his wheel down in a rut and fell over. But as an honest Mainer he walked back down about 10 feet before remounting so to be sure he rode the whole hill. Is that correct terminology Dan? Though phonetically you would say "Mainuh." Ayuh, "Mainuh" is wickid pissah. I've never fallen over on a climb either, but I have had a bear of a time getting going again after stopping. The first time I recall was on the "5 mile grade" on Mt. Washington, back in the days when I was using toe clips and straps. I couldn't start facing across the road because it was too narrow and I would block the traffic going up and down (it was open to the public back then). I ended up grabbing onto a boulder for support while getting my foot into the toeclip and dragging myself forward to get going again. Back then, I only had a 38x28 low gear, which made it tough. No Mainuh says "wicked pissah." Only Massholes say that. Loose ground under that kind of grade... Pass. On pavement I recall someone telling us the grade we just barely popped over was 30ish. It would have been impossible to get over it seated unless you had 20-22 GI I'd have guessed. The lowest any of us had was more like 34 GI at that time. 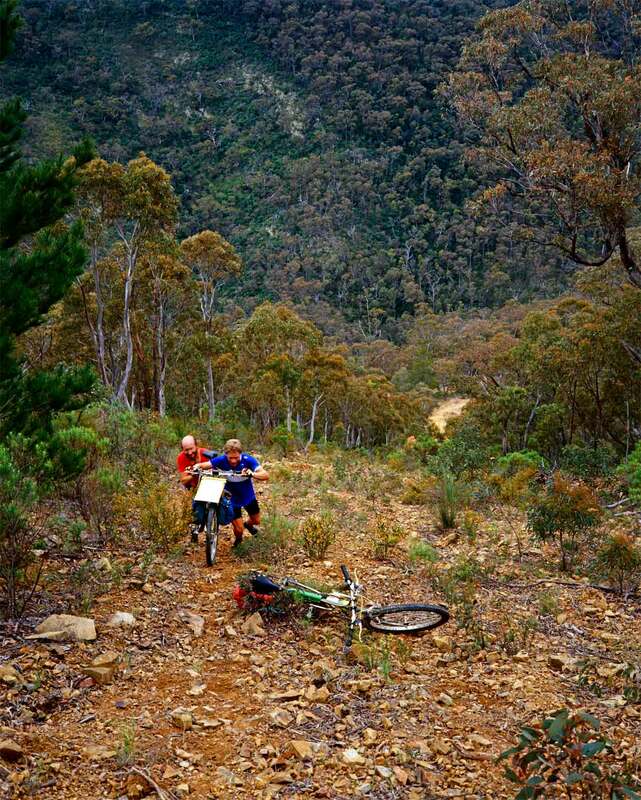 The ride down was a different way on a much better trail with a more sensible gradient. I can remember that on the way up I was a bit ahead, turned a corner, saw this impossibly steep section where the photo was taken, and started to laugh. The others, who couldn't yet see this, called out asking what was so funny. I replied: "You'll see when you get here".